Manage your company with Freshdesk and the web-based Online SQL Editor. Invantive's free Online SQL Editor for Freshdesk provides you with real-time business knowledge across your entire enterprise. Manage your company with Freshdesk and the web-based Online SQL Editor Invantive's free Online SQL Editor for Freshdesk provides you with real-time business knowledge across your entire enterprise. It provides access to your crucial company information stored in Freshdesk. No programming, no coding, no Excel downloads; just use the SQL knowledge you already have. This enables you to analyze your business data fast for correct decision making. You are be able to extract and analyze business data such as tickets, customer complaints, customer data, quality management and customer satisfaction. It doesn't matter where you are; you can login from any location via the web browser and retrieve tickets, contacts and all other information available through APIs using SQL. 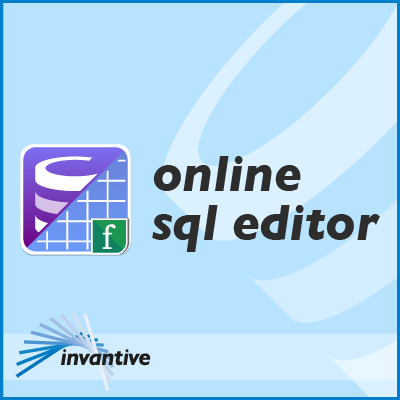 The Online SQL Editor provides all the functionalities needed to make business decisions using your smart phone, iPad, iMac or PC. SQL Query of business data in Freshdesk The FreshDesk Edition of the Online SQL Editor provides you with benefits such as: - Interactive and online access to your company information via any modern web browser. - Usable from any location and any platform, such as Windows, Mac, Linux, iPhone, iPad etc. - Connect directly with cloud platforms with the same credentials as you normally use. - All Freshdesk APIs accessible. We also provide products for Excel, Word, SQL, ETL and Explorer. - Invantive free SQL Query Tool enables you to extract, analyze and to a certain extend report business data, such as tickets, customer complaints, customer data, quality management and customer satisfaction. - With Invantive Control for Excel you will be able to control your customer support, calculate KPIs and project your future customer satisfaction in real-time from within Microsoft Excel. - Invantive Composition for Word is a complete solution for the automatic creation fo complex documents in Microsoft Word with data and tables from the Freshdesk database. - Invantive Data Hub is command-line drive software that is capable of executing Invantive scripting language compatible scripts accross many databases an cloud platforms. Ideal for high volume data loads into and extractions of Freshdesk. More information as well as the downloadlinks you can find on www.freshdesk-apps-by-invantive.com. Once you click on the Login button on the URL https://online-sql-editor.com/, you'll be able to use your Freshdesk credentials to login to the Online SQL Editor. For use we request you to provide us with your contact data. The supported SQL grammar for your query and the restrictions are available on https://www.invantive.com/products/invantive-sql/grammar, but of course the most SQL statements you have learned using ODBC driver or JDBC will work too.